Yes! 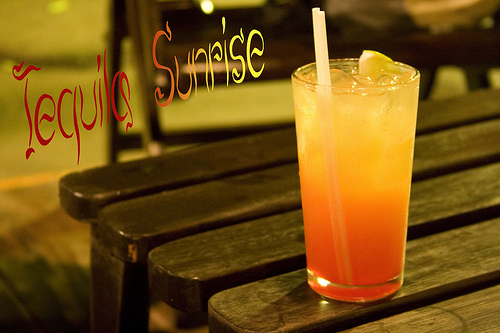 A Tequila Sunrise…who can deny that this drink looks so refreshing and delicious! It’s no wonder that this drink inspired songwriter Glen Frey of The Eagles (one of my favorite bands) to name one of his classics “Tequila Sunrise” because, as the story goes, he had just finished writing the song, along with his tequila, right before the sunrise. But it’s not only because of the song that this drink is among those that characterize Mexican Drinks, right up there with the Margarita and Piña Colada. You may think it’s not a big deal to prepare this drink, but as you can see, it’s not just a matter of mixing ingredients. You have to carefully follow a few steps so the warm red and yellow hues stay in place, thus mimicking a beautiful Mexican Sunrise! 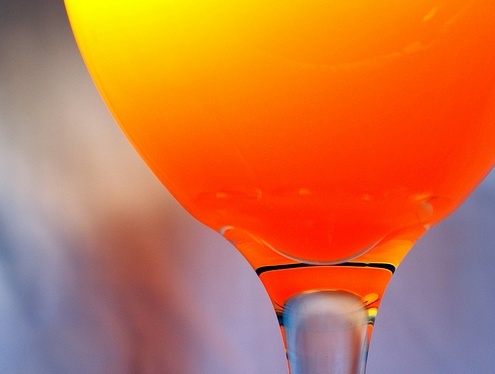 Pour the tequila into a highball glass filled with ice, and then add the orange juice. Stir well. Add the granedine by tilting the glass and pouring grenadine down the inside of the glass while simultaneously flippingthe bottle of grenadine vertically very quickly. Then grenadine should straight down to the bottom and then rise up slowly through the drink. Of course, finish off with a straw, and garnish with a maraschino cherry and orange slice. This entry is filed under Drinks, Tequila. You can follow any responses to this entry through the RSS 2.0 feed. You can skip to the end and leave a response. Pinging is currently not allowed.